As defined in the state highway code, there is no distinction between "Interstates", "US Highways", and state highways -- they are all state highways. Federal law is different. Federal Law (specifically 23 USC 103, which was significantly reworked by Intermodal Surface Transportation Efficiency Act (ISTEA) of 1991) defines two highway systems: the National Highway System (NHS) and the Interstate System, which is a component of the National Highway System. Note that this is a change from the original method of Interstate funding, where there were four Federal-Aid systems: Interstate, Primary, Secondary, and Urban. To connect by routes, as direct as practicable, the principal metropolitan areas, cities, and industrial centers. To serve the national defense. To the maximum extent practicable, to connect at suitable border points with routes of continental importance in Canada and Mexico. The Interstate system has a maximum number of miles defined in law: it cannot exceed 43,000 miles (currently, it is at 42,795 miles). This milage does not include milage signed as interstate under 23 USC 103(4). Such milage is colloquially called "non-chargeable" milage. Under ISTEA, the Interstate Program includes completion funding for Interstate Construction, Interstate Substitute highway projects, and an Interstate Maintenance program to rehabilitate, restore, and resurface the Interstate system. Reconstruction is also eligible for funding if it does not add capacity, except for high occupancy vehicle (HOV) or auxiliary lanes. Federal Aid comes in multiple forms. The Surface Transportation Program can be used on Interstate, National Highway System, and all roads functionally classified by FHWA as other than local or rural minor collectors. The Congestion Mitigation and Air Quality Improvement Program is directed towards transportation projects which will contribute to Clean Air Act requirements in non-attainment areas for ozone and carbon monoxide. The Bridge Replacement and Rehabilitation Program is continued. According to the FHWA, to mark the Interstate routes, the American Association of State Highway Officials (AASHO) asked its member states to submit suggestions. The States submitted dozens of ideas in several forms, ranging from a 55mm color transparency to a 4-foot square aluminum blank. The signs were tested, an a final version, a combination of submissions from Missouri and Texas, was selected. On September 19, 1967, the U.S. Patent and Trademark Office issued Trademark Registration 835,635 for the shield. The direction of a freeway and the major destinations or control cities (see Section 2D.34) along it shall be clearly identified through the use of appropriate destination legends. Successive freeway guide signs shall provide continuity in destination names and consistency with available map information. At any decision point, a given destination shall be indicated by way of only one route. Control city legends are required to be used at interchanges, separation points of overlapping freeway routes, on directional signs on intersecting routes, on Pull-Through signs, and on the bottom line of post-interchange distance signs. Other routes do not have control cities—they are forward directions. The difference is that continuous signing is (nationally) guaranteed for a control city. It appears on every pull-through sign on the Interstate leading to it until it is reached, then the next control city appears on every pull-through until that is reached, and so on. This doesn't work for things like loop routes (3-digits) or spurs (which might be within a city); and AASHTO doesn't have jurisdiction over the state routes. But, just to confuse things, the term "control city" is also used at the state level, in a more broader sense, to refer to any one on a list of forward destinations that are to be signed on the state highway system (not just Interstates or freeways). Examples of documents referring to designated control cities are Caltrans' own 'M.U.T.C.D.' Supplement (which, however, only directs the Districts to come up with control city lists--no set of control cities is actually given in the Supplement). Often, the forward destinations are the ultimate destinations, or (such as with I-405) the names of cities reachable with the next Interstate connection (Sacramento, Santa Monica, Long Beach, San Diego). First, to eliminate some confusion, thanks to a posting by Paul Wolf: All highways in the US, except on federally-owned land (such as within national parks) are state or locally maintained, although many are eligible for federal aid in construction. The Interstate system created in 1956 has a specific set of design criteria, and specific funding ratios. The design criteria and funding ratios are different from that of the 1926 Federal system. The standards include a minimum of four 12-foot wide travel lanes, a minimum shoulder width of 10 feet, full control of access, and design speeds of 50 to 70 miles per hour (depending on the type of terrain). Initially, the design had to be adequate to meet the traffic volumes expected in 1975. Later, the requirement was changed to a more general 20-year design period rather than for a specific year to allow for evolution of the System. The design standards have been codified in Section 109(b), 23 U.S.C. The Federal government, working with the states, established the system (i.e. designated the general corridors, but not the exact locations) and allocated the milage to the states. The states designed and built the roads, with the Federal government reviewing and approving the plans. States could, and did, decide not to build portions of the system. There are also routes built to the standards of the system, usually with some percentage of federal money, that were not chargable to the milage in the system, but were signed as part of the system. The Interstate System was created by the 1944 Federal-Aid Highway act, which authorized 40,000 miles nationally. California was initially allocated 1,938 miles. Later allocations in 1955 brought the total milage to 2,135 miles. The 1956 Federal-Aid Highway Act authorized an additional 1,000 miles nationally; California received none of this. The 1968 Highway Act added another 1,500 miles, expanding the system to 42,500 miles. An amendment sponsored by U.S. Representatives James Howard and William Cramer authorized an additional 200 miles for modification or revision of the basic System. The mileage authorized under the Howard-Cramer Amendment was increased eventually to 500 miles under the Federal-Aid Highway Act of 1973. The Intermodal Surface Transportation Efficiency Act (ISTEA) of 1991 brought the total authorized milage to 43,000. Of these miles, California has been allocated 2,311 miles. This milage is called "chargeable Interstate". All of this milage is/was eligible for construction with regular Interstate funds. The Surface Transportation Assistance Act of 1978 provided full Interstate Construction funding for all routes designated under previous System adjustments. Another provision of this Act prohibited the use of Interstate Construction (IC) funds for the construction of any new miles designated after passage of the Act. A total of 42,795 miles had been designated for development with IC funds before this measure was enacted. The following is a history of routes submitted for inclusion as chargable miles in the Interstate system. Information and maps of the original Interstate proposals may be found at http://www.roadfan.com/intreg.html#yellowbk. Note that these dates are based on those shown in the Caltrans history of Interstate submissions. They may correspond to initial submission dates, or dates the basic route was approved, but not necessarily the number. Caltrans documents show this as being approved in 1947, although later documents the number having been approved as of October 1956. In a letter dated November 8, 1957, G.T. McCoy of the Department of Highways recommended that I-5 become I-11, to allow assignment of I-3 and I-5 to the Bay Area (for the San Francisco Bay circumferential routes, which later became I-280 and I-680). However, by August 1958, the Department of Highways had gone back to recommending I-5. Other letters objected to proposed I-5W through the Bay Area, because the suffix would be confusing. However, the original assignments did result in I-5 and I-5W, although some maps show I-5 and I-5E. In September 1957, before route numbers were finalized, Arizona suggested that present-day I-8 and I-10 be numbered as I-10 and I-12, respectively (I-10 for the San Diego-Yuma-Casa Grande-Tucson-Lordsburg freeway, I-12 for the Los Angeles-Ehrenberg-Phoenix freeway). In December 1957, the California Department of Highways concurred with this suggestion. However, by April 1958, Arizona was suggesting the I-8 and I-10 numbering, which was approved by AASHTO on June 25, 1958. The Arizona proposal had the side effect of having California propose renumbering what they had proposed as I-12 (now I-210) as I-14. In November 1957, California officials objected to the route number duplication between proposed I-40 and I-80, and existing US 40 and US 80 elsewhere in the state. They suggested that I-40 and I-80 become, respectively, I-30 and I-76. Arizona endorsed this suggestion, but AASHTO went with the I-40 and I-80 designations. Another rationale for I-76 was to provide a future number for a northerly bypass of Sacramento (current I-80, but originally proposed as I-880). Originally, these routes were numbered as I-5W. In the map that accompanied the November 1957 letter proposing I-76, I-505 is shown proposed as I-7, and I-580 is shown as I-72. It is interesting that in all their proposal for interstate numbers, the California Department of Highways never proposed I–1. This could be because they were hoping that number might be used for the US 101 routing between Los Angeles and San Francisco, which would actually provide many large cities with an interstate. California officials suggested two-digit Interstate assignments for some routes that are now three-digits: I-9 for what ultimately became I-405; I-12 (then I-14) for what became I-210, and I-13 for what became I-605. There was one proposal that showed I-405 as I-3, I-605 as I-105, and I-210 as I-102, but this was flatly rejected by AASHTO. These routes were submitted in 1947, but the numbering was not approved by AASHTO unitl 1955, probably because AASHTO was focusing on the long-haul, two-digit routes first. 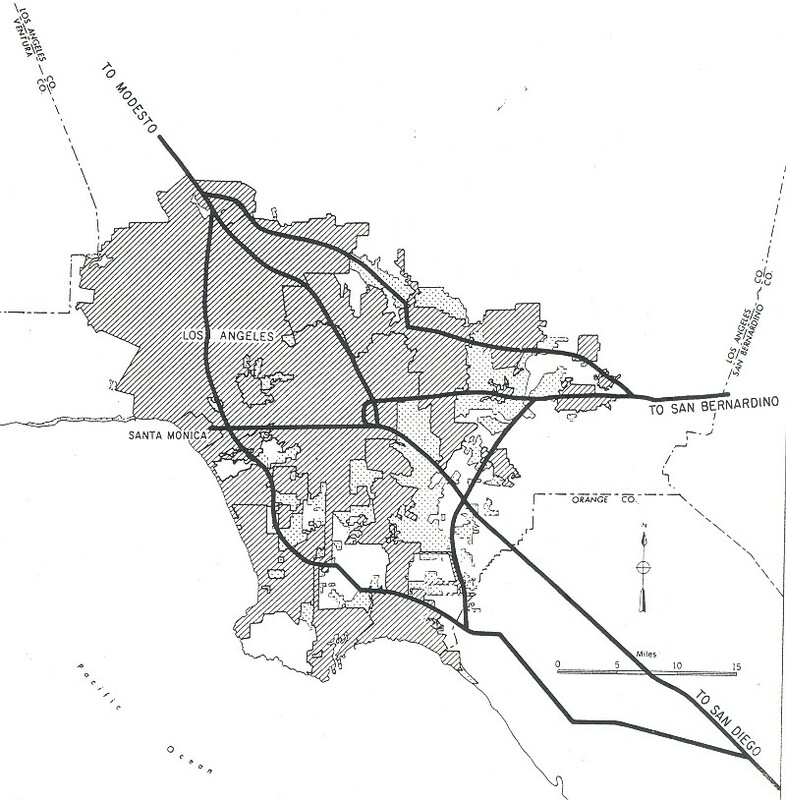 In November 1957, the San Francisco circumferential routes were proposed as I-3 and I-5. By August 1958, these routes were being proposed as I-180 and I-580. In November 1958, these routes were approved as I-280 and I-680. There was one proposal that showed I-280 as I-109 and I-680 as I-113, but this was flatly rejected by AASHTO. In August 1958, this route was proposed as I-380. In November 1958, this route was approved as I-480. One early proposal showed this as I-110, but this was flatly rejected by AASHTO. There are some who surmise that, if approved, this would have been proposed as an extension to I-40, given that I-40 terminates in Barstow, and the (former) US 99 corridor has a dearth of interstates. 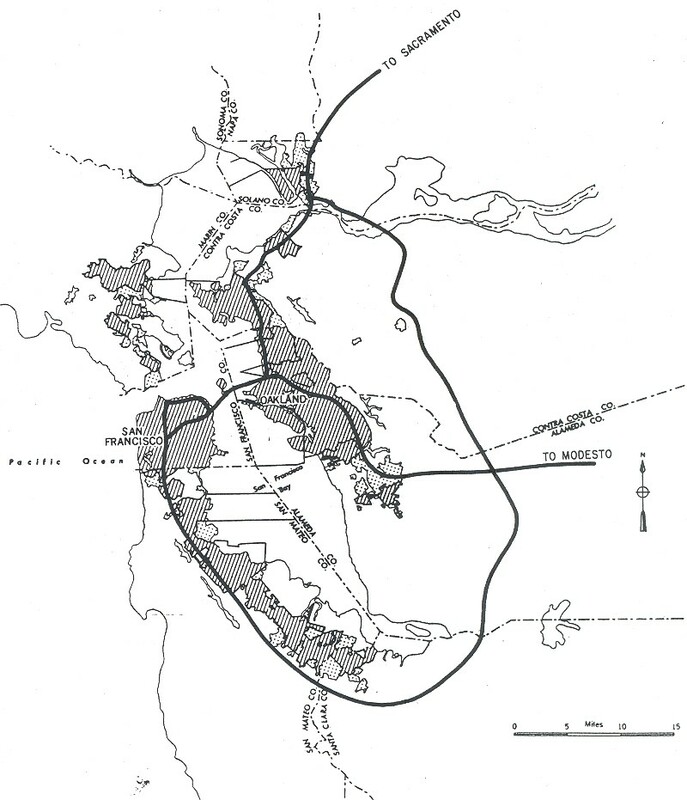 These routes would have connected to existing I-880 (now I-80) in Sacramento, making I-880 into a true loop around the city of Sacramento. Hence, this would likely have been numbered as I-880 (it was proposed before the I-80 rebuild was cancelled). I-10512 Delete (portion) in Central L.A.
I-11012 Delete (portion) in Central L.A.
I-80: 5.2/5.3 mi withdrawn per 23 USC 103(e)(2). I-280: 6.7 mi withdrawn per 23 USC 103(e)(2). Subsequent rerouting for continuity purposes actually increased its length by a little over 2 miles. I-480: 5.5 mi withdrawn per 23 USC 103(e)(2). I-105: 1.3 mi deleted under 23 USC 103(f). I-110: 0.7 mi deleted under 23 USC 103(f). These changes resulted in a net of 7 miles being charged against the 103(e)(2) limitations. These 7 miles reappeared as part of the Century Freeway, new I-105 (see below), which had 10.3 miles from 23 USC 103(e)(1), and 7 miles from 23 USC 103(e)(2). Although this was not approved in 1970, this segment is now part of Route 210, and is being resubmitted to AASHTO, probably as non-chargable interstate milage. This segment was later approved as non-chargable [139(a)] I-238. Corona-Norco adjustment N of Temecula to Devore: February 1972. This may be the San Bernardino West Bypass, the 14.2 mi segment that was pending in 1970. This history of this segment is very confusing. It appears that between 1965 and 1986, the segment of US 395 from San Diego to San Bernardino was signed as TEMP I-15/US renumbered as I-15 (actually, a new I-15 freeway was constructed), with the older US 395 routing being redesignated as I-15E or I-215 (the designations swapped at times). It is unclear which routing was proposed in 1968: the US 395 routing, or the Route 71/Route 31 routing. This segment was originally part of Route 186. This segment was originally Route 243. This was formerly part of Route 11, and with the approval of this segment, was renumbered I-110. For continuity of numbering, the remaining segment of Route 11 north of I-10 was renumbered as State Route 110. 139(a) (now 23 USC 103(c)(4)(A)) milage are routes that already meet Interstate standards and can be immediately signed as interstates once the proposed number is approved. 139(b) (now 23 USC 103(c)(4)(B)) milage is designated as a future part of the system once Interstate construction standards are met. It cannot be signed as interstate until then. Be a logical addition to the System. Although Section 103(c)(4)(A) segments look like any other Interstate highway, they are not eligible for development with IC funds. In all, the FHWA has approved 2,145.29 miles of highways in the contiguous 48 States, District of Columbia, and Hawaii as Section 103(c)(4)(A) additions to the Interstate System (including additions under former Section 139(a)). Also added to the Interstate System under Section 103(c)(4)(A) are highways in Alaska and Puerto Rico for a total of 1,331.99 miles (including additions under former Section 139(c)). Alaska and Puerto Rico are exempt from the design standards of Section 109(b). Section 103(c)(1)(B)(ii), 23 U.S.C., states: "Highways on the Interstate System in Alaska and Puerto Rico shall be designed in accordance with such geometric and construction standards as are adequate for current and probable future traffic demands and the needs of the locality of the highway." Connect with an existing Interstate route. Route 215 The FHA approved future I-15E (changed to I-215, June 1982) as non-chargable mileage between Route 60 and I-15.